Before you get all "only in America" on me, I have good reason for cooking for my dogs. It didn't start as a thing to pamper my pets at all. In fact, it all began when my dachshund, Oscar, hurt his back very badly in April and the vet recommended surgery. Instead of surgery, we decided to go holistic and to take him to a vet that specialized in acupuncture. The acupuncture was far cheaper than surgery and what to do know--it was totally effective in helping with Oscar's back. Today, he is fully up to speed. Also on the regimen were other Traditional Chinese Medicine techniques like Chinese herbs and diet changes. There are many foods that help move energy through the body and help dogs with certain injuries, like Oscar's which was "stagnation." Also, my vet told me that Oscar needed more cooling foods to help him "cool down" because according to Traditional Chinese Medicine, he runs a little hot. Of course, I am giving you the simplified version of all this, but long story short it wasn't too long before all three of my pooches were enjoying the benefits of Traditional Chinese Medicine diets. This is only the first in a small series of posts of cooking for your dog; because it's a lot to cover and I want to give as much information as possible. The first thing I was most surprised about when being introduced to diet was that my dogs could eat a lot more foods than I thought that they could. The first and most important thing about the diet is that you want to start with a healthy base. This is your dog food. Iams, Science Diet, Kibble--it's all garbage and has a ton of stuff, like bone meal and wheat, that is bad for your dog. So you want to switch your dog to a better, more high quality food that doesn't include wheat. We feed a limited ingredient diet that is gluten free. Once you have done that, you can start adding some healthy TCM foods. You want to introduce foods slowly to learn which ones your animals like the best. It may surprise you what they like and what they don't. Two foods that we started with were foods that stimulate the bladder, as our dogs age, we want them to have good strong bladders. These are eggs and beets. The beets you can feed a little more than the eggs, just because of the fat content... but a word to the wise--beets can change the stool and urine color of your dog, so don't be alarmed! The other foods your can add at first are some neutral foods. Neutral foods are, as you might have guessed, neither yin nor yang. They are also like a "base" food, like the dog food, that you can add things to. White rice is a great one because it's cheap and easy. Also carrots (which can also help if your dog coughs a lot) potato, pineapple, yams, and apples are all great neutral foods. Since I have three dogs, for their breakfast I will scramble two eggs and divide it among the three of them. For dinner we might do some white rice nixed with carrots, or sometimes just some potatoes in with the dog food. The next day, I might do some beets for breakfast and then for dinner some tomatoes with rice. It's important to know that you can feed as many veggies as you want, but that you want to be more sparing with the carbs and fats. For my border collies, who are medium dogs, my girl (who is a little more overweight and prone to weight gain) gets 1/2 cup of food plus veggies twice a day. My male gets double that. My dachshund gets 1/8 cup of food plus veggies twice a day. 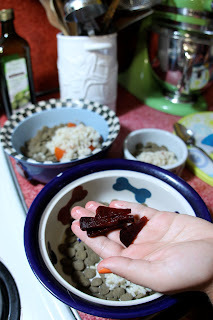 Your vet can give you proper amounts for your own dogs, but as far as some good starters, the above-mentioned foods in addition to your dog food can really beneficial and get you started on the road to Traditional Chinese Medicine for your poochy pals!